It is a procedure that allows the doctor to look inside your large intestine (colon) using a flexible tube called a colonoscope. The colonoscopes have a small camera at the tip of a thin tube. The procedure allows the doctor to see things like swollen tissue, abnormal growths, and ulcers. 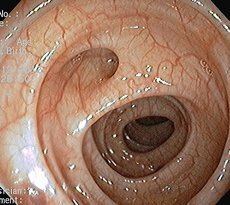 Polyps may also be removed from your colon during a colonoscopy.